We have a wonderful meeting lined up for March 17. I’m excited to bring Kim Harris and K.J. Waters to our fair city. Both have years of expertise between them and will share their knowledge. Kim Harris will present Adding Humor to Your Writing the first hour. Humor is a multi-tasking powerhouse in your writing. A joke can instantly show characterization, reveal relationships, shift the tension of your plot, deliver a painful truth in an easy-to-swallow way, and even endear you to readers. And what writer doesn’t want to be endeared by their readers?! Unfortunately, many writers believe that writing humor is either out of their depth—they’ve been told that humor is much more difficult to write than drama—or that it has no place in their books. This presentation will highlight the many ways humor can bump up your writing, even if you’re not writing a ‘funny’ book, and she’ll go over some classic tales that have expertly used humor to memorable effect. For the second half, K.J. Waters will present What I’ve learned as an Indie Author. In this one-hour presentation, KJ Waters will share what she has learned as an Indie author including her secret recipe to becoming an Amazon best-selling author, how she grew her author platform to 50,000 followers, and how to use an integrated social media strategy and author brand to market her work. You don’t want to miss this! Both of these ladies will provide immeasurable help in getting your career ramped up and racing down the track. Please come out and grab this information while you can. I know you’ll enjoy what Kim and K.J. bring to the table, so make your plans. Kim Hunt Harris is Wall Street Journal bestselling author of the Trailer Park Princess cozy mystery comedy series. She knew she wanted to be a writer before she even knew how to write. When her parents read bedtime stories to her, she wanted to be a part of the story world. Kim started out writing children’s stories, and they grew as she did. She discovered a gift for humor and a love for making people laugh with her tales, and the Trailer Park Princess series was born. She lives with her husband of more than thirty years and two teenage kids in West Texas. 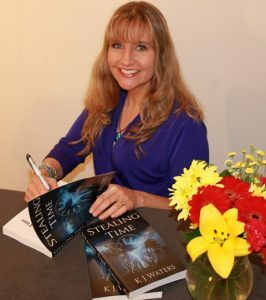 KJ Waters is the #1 Best Selling author on Amazon with two books in the Stealing Time series with two more the way and a short story called Blow. 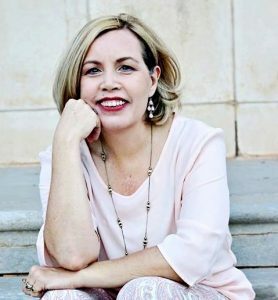 She is the CEO of Blondie’s Custom Book Covers, and an indie author hosting the popular podcast Blondie and the Brit – Writing, Publishing, and Beyond with International best-selling author Suzanne Kelman. She provides author consulting focusing on author platforms and branding, indie publishing, and book marketing. She has a Master’s in Business Administration and 18 years of experience in marketing.